The Trans-Alaska Pipeline was shot by a drunk. The pipeline, which carries more than 15% of America's domestic oil production, is 800 miles long and runs from Prudhoe Bay in the Arctic to the Prince William Sound port of Valdez in the south. Daniel Carson Lewis has been charged with shooting the pipeline with a rifle and has been charged with criminal mischief, driving while drunk, weapons misconduct and assault. At 2 a.m. Oct. 3, the day before the shooting, Randy was asleep when Danny Lewis came through the door. He had just driven a four-wheeler 80 miles from Fairbanks along the pipeline. He was hung over and hungry. The next morning, the two brothers salvaged a water pump from a junked car behind the homestead and sold it to a neighbor, getting $18, Randy said. His brother went down the road and bought hot dogs and two bottles of Canadian whiskey in the store. The brothers spent the day fixing their all-terrain vehicles. The next day they took a bottle of whiskey, Randy's dog Lil' Bear and headed across the road toward the trans-Alaska oil pipeline to hunt. Danny Lewis carried his brother's .338-caliber rifle - a large gun for moose and bear hunting. Randy Lewis said they were headed to a nearby lake for bird hunting. When they passed the pipeline on the way to the lake, Danny shot at one of the thick steel supports that hold up the oil pipeline. He took a second shot at one of the tall columns atop the supports. The two had little luck hunting. "We'd stop. Take a shot (of whiskey). Keep going," Randy said. Shortly after 2 p.m., they returned to the dirt access road along the pipeline. They stopped, took a swig and Danny leveled his gun at the pipeline. "I said: 'Don't shoot that pipeline,' " Randy Lewis said. His brother turned angry and pointed the gun at Randy, he said. "I'll shoot it if I want. I'll put a hole right through it," Randy Lewis remembered his brother saying. He pointed the gun back at the pipe, shot, then drove further along the line and shot again. "I got it!" Danny yelled as a spray of oil shot from the pipe. He jumped back on the four-wheeler and tore off, heading north along the road next to the pipe. Four hours later, troopers arrested Danny Lewis outside the homestead. A jury found him guilty of criminal mischief, assault and drunk driving, all felonies, and the misdemeanor counts of oil pollution and misconduct involving a weapon, and causing 285,000 gallons of crude to coat a forested area has been ordered to pay over $17 million in restitution for the act. It is highly unlikely that Daniel Lewis, now in jail in Fairbanks after receiving a 16-year sentence will be able to come up with such compensation, officials acknowledged. Lewis, who shot the 800-mile oil line near its midpoint, has little employment history and only sparse sources of income, they said. 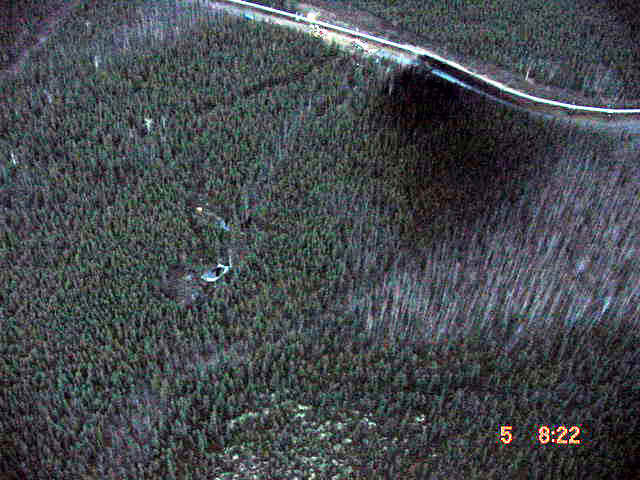 In 1978, about 670,000 gallons of oil spilled after a hole was blasted with explosives near Fairbanks. No one has ever been arrested or charged for the incident. 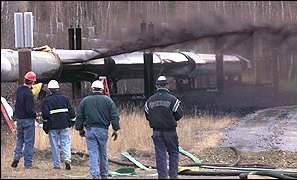 ANCHORAGE, AK – October 4, 2001 4:55 PM – The trans-Alaska pipeline was shut down at about 2:30 p.m. today after an Alyeska surveillance helicopter detected oil on the ground in the vicinity of milepost 400, about 15 miles north of pump station 7. The surveillance crew detected what appears to be a bullet hole in the pipe. Alyeska’s Operations Control Center immediately began the process of shutting down the north end of the line, above the site of the incident. Flow continued below the site to relieve pressure on the pipe. Alyeska asked North Slope producers to reduce production to 50 percent. Alyeska response crews are on their way to the scene to attempt to stop the leak and clean up the oil. So far, there is no estimate of how much oil has leaked. Alaska State Troopers have been dispatched to the scene. All appropriate government agencies have been notified. 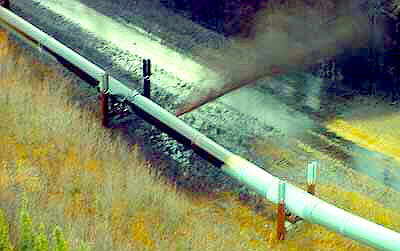 Leak Update ANCHORAGE, AK – October 5, 2001 12:30 AM – Work crews are preparing to begin the repair of the trans-Alaska pipeline after a bullet penetrated a section of the 800 mile pipe Thursday afternoon. About 3:00 p.m., an Alyeska Security surveillance helicopter detected oil on the ground in the vicinity of milepost 400, about 15 miles north of Pump Station 7. The surveillance crew detected oil escaping through what appeared to be a bullet hole in the pipe. A suspect believed to be responsible for shooting the pipeline is in Alaska State Trooper custody. Upon notification of the incident and a drop in pressure on the line, Alyeska’s Operations Control Center immediately began the process of shutting down the north end of the line. Oil was allowed to flow south through the line in an effort to reduce oil pressure. Alyeska immediately mobilized response crews, heavy machinery and a special land spill strike team to the scene to clean up the oil. Crews are preparing to repair the damaged section of the pipe in an effort to return it to normal operation as soon as possible. Though the amount of oil spilled due to the rupture in the pipe is unknown at this time, Alyeska officials are characterizing the spill as significant. The oil sprayed about 75 feet out from the pipeline covering an area on the ground measuring about 75 square yards. Pressure inside the pipeline was approximately 525 pounds per square inch at the time of the incident and continues to be high at this time. Normal tanker loading operations will continue at the Valdez Marine Terminal using oil from the storage tanks at the terminal while the line is being repaired. There are no significant rivers or streams in the immediate vicinity of the spill. There have not been any reports of injury to humans or wildlife as a result of the spill. 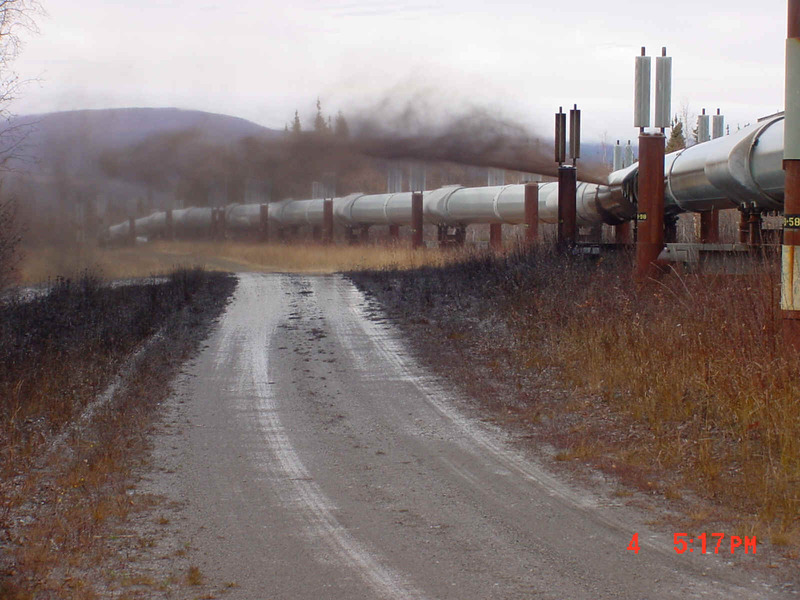 -Pipeline Operational ANCHORAGE, AK – October 7, 2001 11:00 AM – The Trans-Alaska pipeline was restarted at 3:24 a.m. Sunday morning and was fully operational at 7:35a.m.following permanent repair of a puncture Saturday evening. North Slope producers were released to full production at 7:00a.m. Sunday. The Williams and Petro Star Refineries in North Pole were returned to normal supply at 9:00 a.m. Sunday. The pipeline shutdown did not impact loading operations at the Valdez Marine Terminal. The pipeline was shutdown Thursday afternoon when oil was discovered on the ground near milepost 400. A suspect is in custody for allegedly shooting the pipeline and causing the rupture. A hydraulic clamp was initially placed on the rupture to stop the spill of oil. 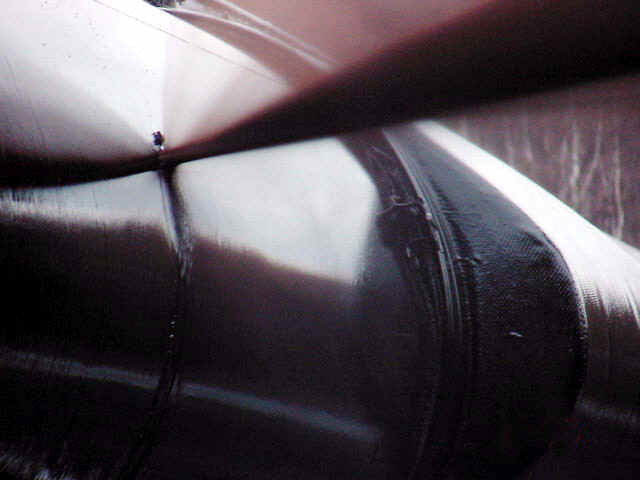 A TOR (Thread O Ring) plug was welded onto the pipeline to permanently repair the damage. This procedure has been used in different repair operations several times on the pipeline and is proven technology. An estimated total of 6,800 barrels or 285,600 gallons were spilled. 2,108 barrels or 88,541 gallons have been recovered as of early Sunday morning. Environmental cleanup efforts continue on site. The Unified Command is now formulating plans for long term environmental cleanup, restoration and monitoring.